Pepsi was trying to project a global message of unity, peace and understanding. Clearly we missed the mark, and we apologize. We did not intend to make light of any serious issue. We are removing the content and halting any further rollout. We also apologize for putting Kendall Jenner in this position. What Pepsi intended and what the advertising firm delivered was a very poignant analysis of our current media landscape but in the context of a two and half minute video, capturing the spirit of commerce as it intermingles with and co-opts artistic creation and popular protest. That is, it perfectly describes how most people engage with social media on a daily basis. Depending on the individual and how they are processed by Facebook's algorithms, the average person is presented with a mixture of personal messaging, popular news articles, and of course, plenty of advertisements. The reason why people like Bernice King are not as upset by seeing a post about a protest on Facebook is not because they are hypocrites but rather because they lack the tools necessary to analyze this new form of media. When a critical eye is used to look at Facebook it becomes obvious that the same relationship between political protest and advertisement occurs everyday on social media platforms. The entirety of Facebook should illicit the same critical response as the one against the Pepsi commercial. In fact, the entire commercial news media industry works in the exact same manner. Cable news channels like CNN and Fox News report on sensational events and then cut to commercials for weight loss programs and pick-up trucks. Newspapers and magazines are overflowing with advertisements for luxury watches and running shoes. 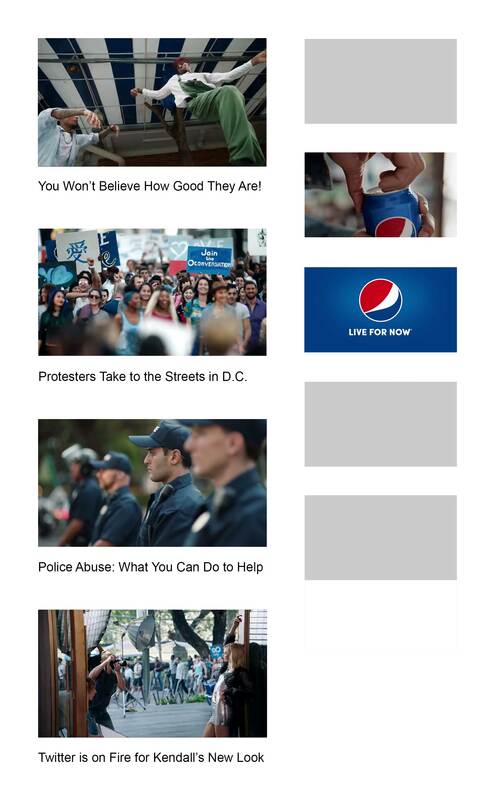 What is different about the Pepsi advertisement is that it is holistic. It is a wonderful work of art that fully captures the entirety of our commercial news media environment. If it is painful to watch it is because our media is the root cause of the suffering. That the video was a source of controversy did nothing but help generate more advertising revenue for a number of different news media outlets and the major social media platforms. Perhaps it even expanded Pepsi's so-called mind share. Digital platforms are for the most part completely agnostic to the notions of good or bad publicity. Notions of good or bad are under the jurisdiction of human morality, not the algorithms used by Facebook and Twitter to increase user engagement. Much like dealing with a school-yard bully, perhaps the best course of action is to ignore the call for political action on social media platforms. Politics might be better expressed in physical reality. Think about what "political action" means in the context of retweets, likes or shares. It should be obvious that there is a world of difference between the physical action of sitting in front of a computer screen and the physical action of marching in protest in a public space.